On Thursday, King Willem-Alexander of the Netherlands turned 50 and there have been all kinds of celebrations going on in his Kingdom since. Yesterday, he celebrated his milestone birthday with friends and royals from around the world. Among others, a dinner took place in The Hague in the evening. While the event was a private one and we need to keep our fingers crossed that there will be some official photos released, some royal guests were seen arriving in the The Hague or getting around the city. Turns out, at least Grand Duke Henri and Grand Duchess Maria Teresa as well as Hereditary Grand Duchess Stéphanie were in the Netherlands for the big birthday bash. Though there is no visual evidence as of yet, I'm assuming the Hereditary Grand Duke was also on hand. Naturally we will keep you updated even any more information and/or pictures become available. In the week since the baptism of Prince Liam, there have been several articles mentioning the young son of Prince Félix and Princess Claire as a Prince of Luxembourg. However, that is not correct. Being the child of a younger son of the Grand Duke, Liam is not a Prince of Luxembourg in accordance with the family bylaws concerning the house law published via the Arrêté grand-ducal of June 18, 2012 but instead a Prince of Nassau (as well as a Prince of Bourbon-Parma as a descendant of Prince Felix, the husband of Grand Duchess Charlotte). Item 2 of paragraph 4b of the bylaws states that "the second and further grade male line marital descendants of the head of the house; with the exception of the offspring of the member of the house called upon to succeed to the throne according to the laws of primogeniture (item 1); and their wives by marriage according to the house rules, have the style of Royal Highness, their first name and the family name “zu Nassau” (“de Nassau”) and the title Prince or Princess of Nassau, etc. etc." The same naturally applies to Liam's sister Amalia, who is a Princess of Nassau (as well as a Prince of Bourbon-Parma). This rule was already introduced in 1995 by way of the Arrêté grand-ducal of September 21 regulating the styles and titles of members of the Grand Ducal Family. It means that the children of Prince Guillaume, younger brother of the Grand Duke, also only carry the title of Prince/Princess of Nassau but not of Luxembourg. (As do the children of Prince Jean though they are in a bit of a special situation considering that there weren't born with the title.) Prince Robert and Princess Charlotte, children of Prince Charles and thus first cousins of the Grand Duke, are an exception to this rule as they were born before it was established. Hence, they hold the title Prince and Princess of Luxembourg, respectively, with the style Royal Highness. Prince Robert's wife and children are styled Royal Highnesses with the title Prince or Princess of Nassau. Prince Liam is also a member of the Grand Ducal Family and Grand Ducal Line but not of the Grand Ducal House as the latter "consists of the head of state (as head of the house), the former heads of state and first grade descendants of a head of the house born within a marriage made according to the house rules." 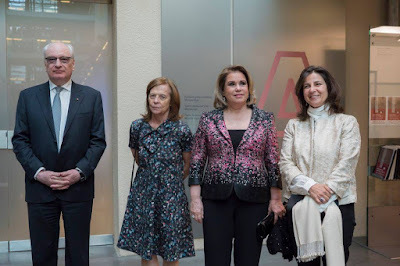 On the evening of the 27th, Grand Duchess Maria Teresa attended the opening of the exhibition Portugal - Drawing the World, which opens to the public on the 28th and runs until October 17th. The exhibition is on display at Luxembourg's Musée national d'histoire et d'art (MNHA), with many pieces on loan from the Museu nacional de arte antiga in Lisbon. The Grand Duchess was accompanied by the Duchess of Braganza. The Secretary of State for Culture Guy Arendt was also in attendance. Other photos available at the MNHA Facebook page. 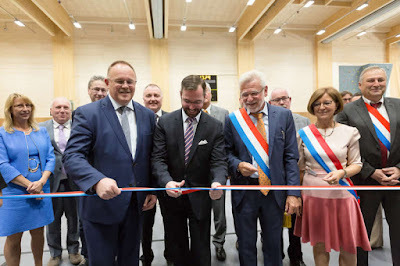 On the 27th, Hereditary Grand Duke Guillaume was in central Luxembourg to help inaugurate the opening of a new school building and sports complex, located in the town of Lorentzweiler (in the canton of Mersch). Campus scolaire Jos Wohlfart was named for Lorentzweiler native and former Chambre des Députés member Joseph Wohlfart. Hereditary Grand Duke Guillaume attended the primary school from 1988 until 1994. Minister of Sports Romain Schneider was also in attendance. 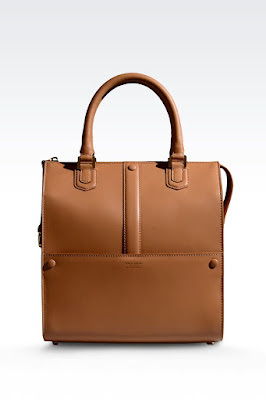 Another photo from the Cour website. Grand Duke Henri is collecting quite the frequent flyer miles this week: After Rome on Saturday, Luxembourg on Monday, he popped up in Sweden today. Together with Queen Silvia he attended a meeting of the Mentor International Foundation at the Royal Palace. The Grand Duke has been a member of the administrative board of the foundation, a non-profit organisation working to prevent drug use and promote health as well as well-being amongst youth, since its creation in 1994. Ever cared to look at almost 1.400 pictures of the Princely Family of Liechtenstein attending one single event? Now is the chance of your lifetime! 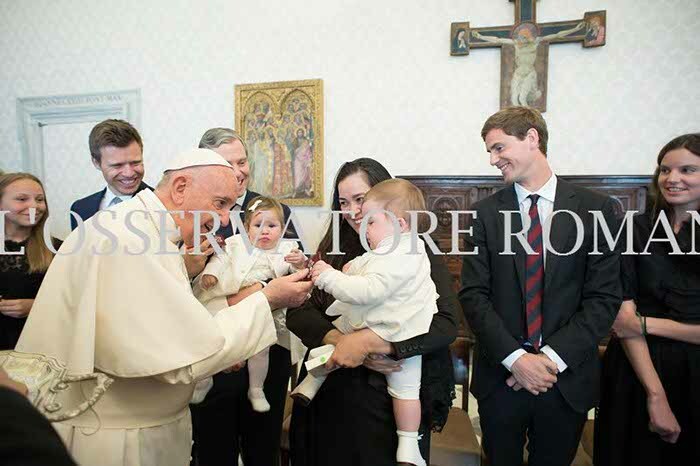 L'Osservatore Romano offers a gallery of visuals of Saturday's visit to the Pope by Prince Hans-Adam and some 36 of his closest relatives containing more than enough pictures to fullfill your wishes. In case you need to brush up on your knowledge of the less regular Liechtenstein faces here at Luxarazzi, we have them all conveniently identified for your here. This weekend, the baptism of Prince Liam and the media coverage surrounding it (or lack thereof) brought up an old topic when it comes to the Grand Ducal Family. It made me exclaim on Twitter: "Sometimes I want to scream at people: It's the Grand Ducal Family of Luxembourg we are talking about - what did you expect?!" It went as far as us being accused of spreading "fake news" just because visual evidence was not readily available three minutes, or even a day, after the event took place. I know that in the day and age of social media, when we see many events unfold right in front of our eyes on our computer or phone screen, a more restraint interaction with the press often seems dubious. However, just because we don't see something, it doesn't mean it is not happening. 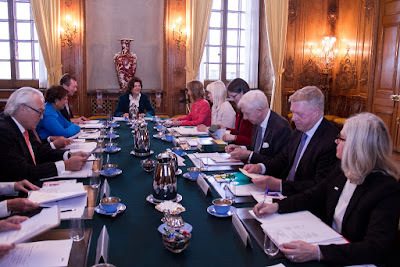 Little information in advance to an event, few pictures of an event by press photographers, and photos officially released by the cour grand-ducale a day or three later certainly is nothing uncommon with the Grand Ducal Family. While I occasionally make snarky remarks about it, I'm not going to write a big post complaining about it because we are not going to change the workings of the cour. I work in the field of public relations myself, and I know how time-consuming and tiring the process of coordinating press releases can be. Could they be quicker? Yes. Are we going to change it? No. It is just the way it is. One thing you can be sure of though is that here at Luxarazzi we are never going to spread "fake news". We only publish information coming from sources we trust - may it be cour, certain news outlets or private individuals. Yes, we have been mistaken in the past and we apologised for it. However, our mistakes have never been about events happening or not happening. To be honest, I have hard time imagining why should we make up a baptism of a member of the Grand Ducal Family, when you can so easy prove us wrong. I feel like I'm sounding like a broken record, but Luxarazzi is just hobby, and nobody makes any money off it. So why should we even attempt to create headlines full of clickbait? Yes, it is nice to see the number of people reading Luxarazzi, but it brings us nothing more than a smile on our faces. While after so many years of Luxarazzi, I still wouldn't call myself a true expert on the Grand Ducal Family (because I keep learning so much), so trust a person who has been a close follower of them for close to eight years now: Some news is real even if not all the details are released - and there is also not a big conspiracy theory or dark secret hidden behind an event if there is little information available. There has been heaps of speculation surrounding the birth and baptism of Prince Liam. Why was his name announced so late? Why were pictures released later than after his sister's birth? Why was he born in Geneva? Why did his family suddenly move to Geneva? Why wasn't the baptism covered more broadly by the media? And why did it take place five months after his birth to begin with? Seriously, people, do you expect a murderer behind every corner?! Was the baptism held relatively late? Yes. Do we know why? No. Usually baptisms in the Grand Ducal Family take place four to six weeks after the birth. Liam was born at the end of November. Maybe both the Nassau and Lademacher families had already made Christmas plans and they weren't able to come together in one place for the baptism? Maybe they had to wait to use a chapel at the Vatican? On January 18, the separation of Prince Louis and Princess Tessy was announced. Just pure speculation on my part, but maybe the family didn't care to hold a semi-public family event at a time when it became official that one part of their family was breaking apart? About four weeks later, Princess Tessy filed for divorce. Just a short while later, on March 1, Lent started. In many Catholic parishes it is common that children are not baptised during the time of Lent (unless the child is seriously ill and in danger of dying). During Lent the holy water is actually removed from churches. And Lent, of course, ended on Easter Sunday, which was just a week ago. You know, there can be and very likely are extremely simple explanations behind many if not all the questions thrown into the mix over the past few days. The cour has never been the ones to keep us fully updated on all the whereabouts and occurrences in the Grand Ducal Family. Members of the family have moved halfway around the world without there ever being an official announcement, so many things may seem way more sudden or mysterious from the outside than they actually are. Would I sometimes like to get more official updates as well as more and quicker pictures of events? Yes. But somehow this mystery and the fact that we do not know what the Grand Duke just ate for lunch or when the Grand Duchess got her last haircut is what got me interested and kept my interest in the Nassaus - even though keeping up with all their events can be tough sometimes as information isn't always readily available. I wouldn't even claim Luxarazzi to be the ultimate source of news and events of the Grand Ducal Family. We do the best we can to find every bit of news; however, there are a number of events undertaken by members of the family that never get published by either the cour or the media: Audiences, low-key visits, and so on - but just because we do not see it, it doesn't that isn't happening. 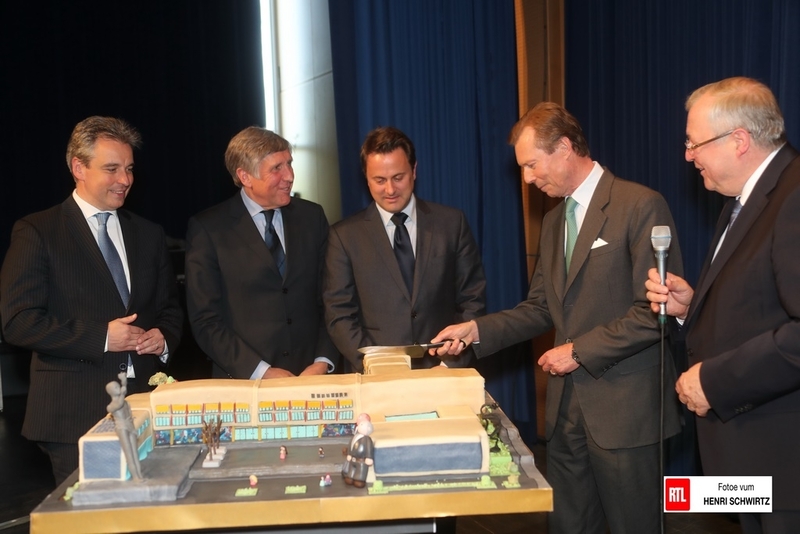 On the 24th, Grand Duke Henri attended the inauguration of the recently renovated high school Athénée de Luxembourg. The school underwent extensive improvements that spanned several years and finished toward the end of 2016; students and staff were able to begin using the new facility upon their return in January. Also in attendance were Prime Minister Xavier Bettel, Minister of Sustainable Development and Infrastructure François Bausch, and Minister for National Education, Children and Youth Claude Meisch. More photos and video from RTL and from the Cour website. Prince Liam, younger child of Prince Félix and Princess Claire, was baptised this Saturday in the Chapel of the Choir within St. Peter's Basilica at the Vatican. His godparents are Prince Sébastien and Anna-Maria Pamin, who was already one of the witnesses to the wedding of Liam's parents. The little prince was born on November 28, 2016. Liam Henri Hartmut, as is his full name, was baptised during a mass concelebrated by Rev. Dr. George Woodall, professor of moral theology at the Pontifical Athenaeum Regina Apostolorum, alma mater of Prince Félix and Prince Claire, and Monsignor Camille Perl. Naturally, Liam's big and super adorable sister Amalia was on hand for the event at the Vatican. Also in attendance were Grand Duke Henri and Grand Duchess Maria Teresa, Hereditary Grand Duke Guillaume - who was responsible for the musical accompaniment - and Hereditary Grand Duchess Stéphanie, Prince Louis, Princess Alexandra, Claire's parents Hartmut and Gabriele Lademacher and her brother Felix, as well as Princess Margaretha and Prince Nikolaus with their children Anunciata, Astrid and Josef (who were all in Rome for the big Liechtenstein gathering anyway). I also spied Prince Lelio Orsini d'Aragona as well as Prince Hugo and Princess Sophie of Windisch-Graetz with their daughter Larissa among the guests. As this post was quickly typed on a phone, please excuse and spelling errors. Once a member of Team Luxarazzi gets near to a computer, we will update this post with more information. In the meantime We did all that but still make sure to enjoy some more pictures over at Wort. Pope Francis received pretty much the entire Princely Family at the Vatican today. (Well, those descending from Prince Franz Josef II and Princess Gina anyway). 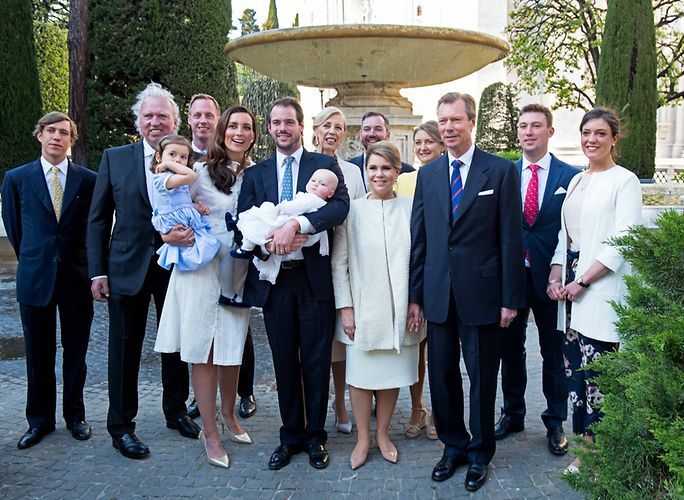 I could spy in pictures: Prince Hans-Adam II and Princess Marie; Hereditary Prince Alois and Hereditary Princess Sophie with Prince Wenzel; Prince Max and Princess Angela; Prince Alfonso; Prince Constantin and Princess Marie with Prince Moritz, Princess Georgina, Prince Benedikt; Princess Tatjana and Philipp von Lattorff with Lukas, Elisabeth, Marie, Camilla, Anna, Sophie; Prince Philipp and Princess Isabelle; Prince Alexander and Princess Astrid with Princess Theodora; Prince Wenzeslaus; Prince Rudolf and Princess Tılsım with Prince Karl Ludwig and Princess Laetitia; Prince Nikolaus and Princess Margaretha, Princess Anunciata; Princess Astrid; Prince Josef; Princess Nora and her daughter Maria Teresa Sartorius y de Liechtenstein. After meeting the Pope, the princely guests also met with His Eminence Cardinal Secretary of State Pietro Parolin, accompanied by Msgr. Antoine Camilleri, under-secretary for Relations with States. As per the Holy See's press release, "During the cordial discussions the good bilateral relations between the Holy See and Liechtenstein were evoked, and the historic role of the Catholic Church and the positive contribution she continues to offer to the life of the country were recognised. Appreciation was then expressed for the Principality’s efforts in the international sphere, particularly in the protection of human rights." More pictures at Getty Images #1, Getty Images #2, APA. 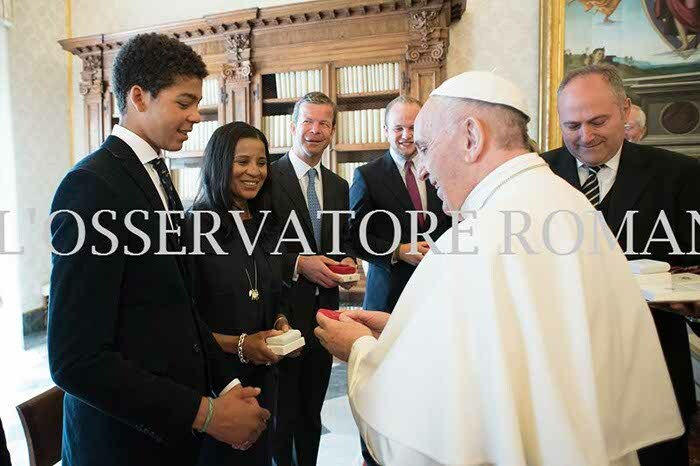 To read about previous Vatican visits by the Princely Family, check out this Luxarazzi 101. 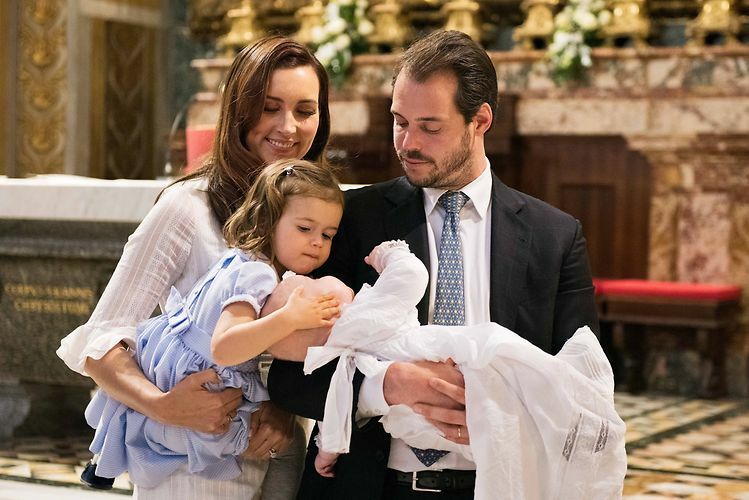 Prince Liam, second child of Prince Félix and Princess Claire, will be baptised at the Vatican tomorrow (Saturday that is). The baptism will be concelebrated by Rev. Dr. George Woodall, professor of moral theology at the Pontifical Athenaeum Regina Apostolorum, alma mater of Félix and Claire and Monsignor Camille Perl. Young Prince Liam was born on November 28, 2016, in Geneva, Switzerland. 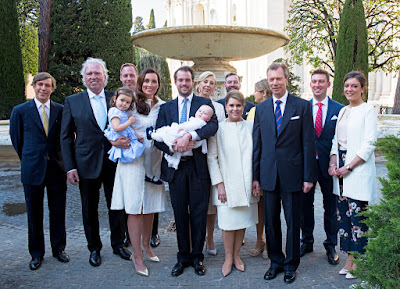 Members of the Grand Ducal Family will be present for the baptism. Not on the guest list are Prince Gabriel and Prince Noah, sons of Prince Louis and his possibly already former wife Tessy. Liam's cousins will not attend "because of their academic obligations". 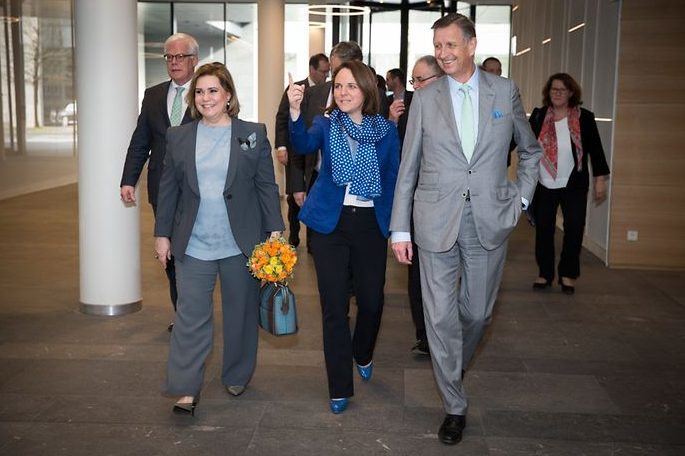 On the 19th, Hereditary Prince Alois was at the University of Liechtenstein to deliver the opening address for the 14th European Chemistry Teachers' Congress (Europäische Chemielehrerkongress). The event, which was being held for the first time in Liechtenstein, featured the organization's motto "Chemistry and Innovation" and highlighted a series of workshops and lectures that more than 500 attendees were able to participate in. Daniel Risch (the Minister of Infrastructure, Economic Affairs and Sport and current Deputy Prime Minister) was also there, along with Dominique Gantenbein (the Minister of Home Affairs, Education and Environment). The Hereditary Prince also attended as a patron of the Europäische Chemielehrerkongress. More photos of the event from Volksblatt. Earlier today, a slightly belated birthday reception was held for Princess Marie, whose actual birthday was late last week on the 14th. She turned 77 this year. A number of government officials, local politicians, and members of the clergy attended the event at Schloss Vaduz to offer their best birthday wishes to Princess Marie. More photos at Vaterland and Volksblatt. 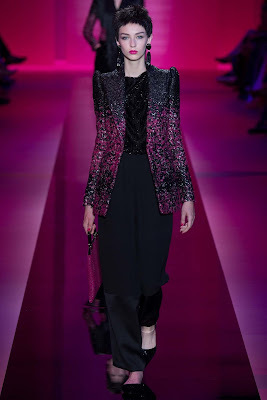 Get the bubbly out, guys and gals, the sisterhood of the travelling clothes is back in Luxarazzi Land! 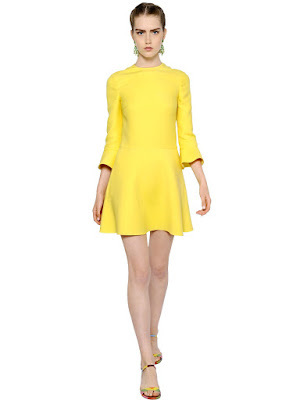 This is not the first, not the second, not the third, not the fourth, not the fifth, not the sixth, not the seventh and neither the eighth but instead the ninth edition to prove that the ladies of the Grand Ducal Family basically share one large walk-in closet. Exhibit A comes by way of Princess Alexandra and Princess Tessy and a light-blue jacket. 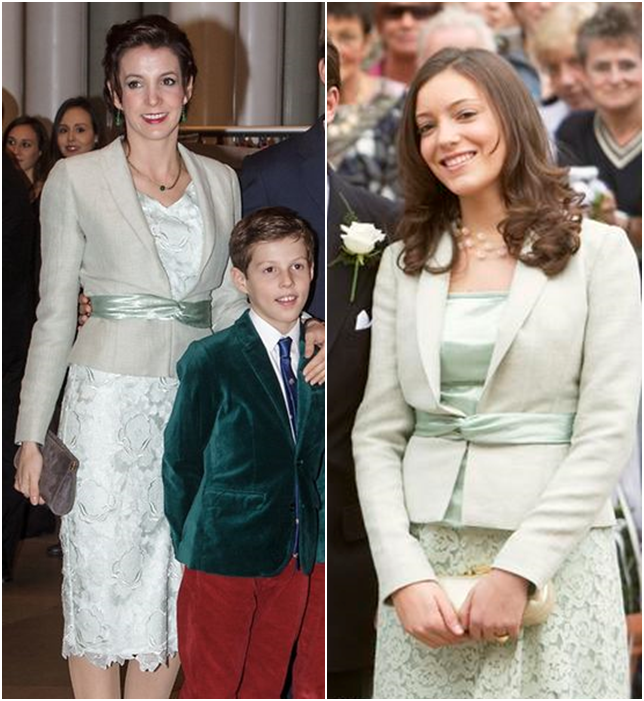 While Princess Alexandra sported the blazer for the wedding of her brother Prince Louis and the former Tessy Antony back in 2006, Princess Tessy herself did so for the 95th birthday of Grand Duke Jean in January 2016. 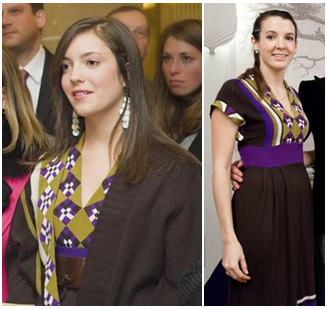 Princess Alexandra and Princess Tessy seem to be on a roll when it comes to the clothes sharing thing! While Alexandra wore this dress for some unidentified event in Luxembourg in 2009, which she attended together with her parents and brother Félix, Tessy sported the dress in 2015 for a showroom presentation by Marcin Lobacz. 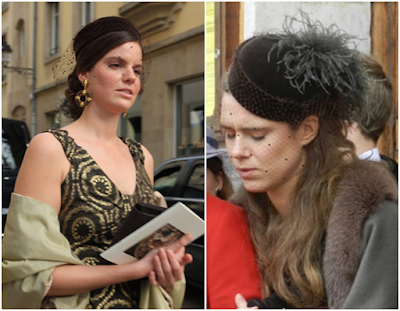 And because our third strike won't come and Team Luxarazzi is slightly bored with the current news drought, here is a sligthly old example of Liechtenstein sister Princess Marie-Astrid and Princess Maria Anunciata wearing the same hat to the weddings of two of their cousins in 2012 to round off our ninth edition of our Royal Recycling and Clothes Sharing series - stay tuned, I'm sure the lovely ladies of Luxembourg (and Liechtenstein) will have some more sharing love in store for us in the future! Our fourth profile in the lives of the children of Grand Duchess Charlotte is the second son and fifth child, Charles. The only brother of Grand Duke Jean, Charles was the first member of the Grand Ducal Family to marry a commoner - and the first to marry a spouse who had been previously divorced. Sadly, he was also the only child of Charlotte's to predecease her, passing away suddenly at the early age of 49. Born at Château de Berg on August 7, 1927, Charles Frédéric Louis Guillaume Marie was christened honor of his great-grandfather, Duke Charles III of Parma, and grandfather Grand Duke Wilhelm (Guillaume) IV. He joined his siblings Jean, Elisabeth, Marie-Adelaide and Marie-Gabrielle in the household. His sister Alix was born in 1929, rounding out the family. As was standard among the grand ducal children, Charles was the subject of a series of stamps issued in 1930. This series was created to benefit Caritas, a Catholic charity with the mission of assisting the poor throughout the world. During his early childhood Charles was educated at home with his siblings by private tutors and experienced a relatively stable childhood. He and his younger sister Alix had their joint First Holy Communion in 1938. In his early teens Charles began attending school in Brussels with his sisters Elisabeth and Marie-Adelaide. The three were visiting in the home of their aunt Zita, the former Austrian Empress, when the Germans invaded Belgium in May 1940. 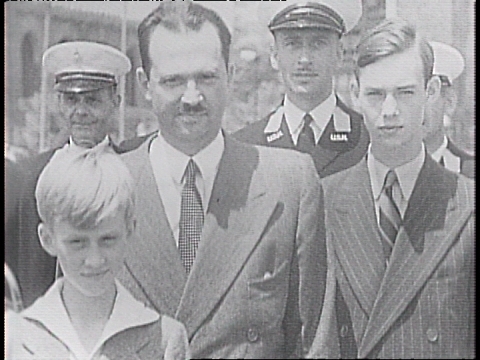 The remainder of the Grand Ducal Family escaped Luxembourg and joined Charles and his siblings in Brussels. The combined families made their way through France, Spain, and finally to Portugal ahead of German forces. 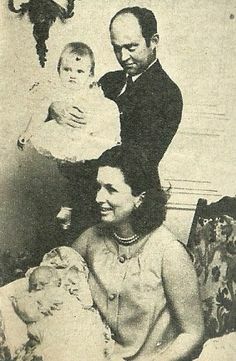 Charles, his siblings, his grandmother Maria Ana, and Prince Felix left Lisbon on July 15, 1940, aboard the American military cruiser USS Trenton. Felix had been granted transport to the United States by President Franklin Roosevelt. Grand Duchess Charlotte had elected to stay in Portugal at least temporarily, saying what must have been a a difficult good-bye to her mother, husband, and children. The family arrived in the United States a little over a week later and settled permanently in the Canadian province of Quebec in the early fall of 1940. Prince Felix (and briefly Grand Duchess Charlotte) remained in Montreal with the Luxembourg government in exile, all six of the grand ducal children continued their schooling 250 kilometers northeast in Quebec City. Hereditary Grand Duke Jean attended classes at Laval University, while all four of the grand ducal daughters were students at the Laval-associated Collège de Jésus Marie de Sillery. Charles attended the Jesuit College (now known as St. Charles Garnier Collège), a secondary school also affiliated with the university. The family made a permanent move to London in 1943, where Charles and his siblings volunteered with the British Red Cross. Charles did make various appearances during the war, both in public and at family events. Charles was present at a mass for his grandmother, Grand Duchess Maria Ana, who died in New York City in July 1942. Charles also appeared occasionally at official events for the Grand Duchy, including the 1940 World's Fair with his father and siblings and at the 700th anniversary celebration of Luxembourg's freedom charter in 1944. Charles presented a copy of the freedom charter to Matthew Woll, president of the Friends of Luxembourg association. Charles and his sisters Elisabeth, Marie-Adelaide, and Marie-Gabrielle returned to Luxembourg on April 17, 1945, driving in a supply convoy of trucks and ambulances donated by the British Red Cross. Prince Felix and Hereditary Grand Duke Jean had participated in the Allied liberation of the Grand Duchy earlier in the month, making their permanent return three days previously along with Grand Duchess Charlotte and Princess Alix, who was too young to drive in the convoy. The entire family was welcomed with great excitement by the people of Luxembourg. In the immediate aftermaths of World War II, Charles helped his father in his work repatriating Luxembourg's deportees and concentration camp survivors. Following his return to Grand Duchy, Charles served in the Luxembourg Army concurrently with attending the Catholic University of Louvain in Belgium. During that time Charles was known for providing rides between Belgium and Luxembourg for his fellow Luxembourgish classmates. During this time Charles was also touted by the English-speaking press as a possible husband for Britain's Princess Margaret, but it is unclear if or how the two even knew one another. 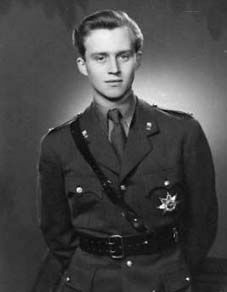 Charles graduated from Louvain in 1952 with a degree in political and social sciences, after which time he continued his military service. Charles spent much of the 1950s and 1960s serving the Grand Duchy in some aspect of commerce or government service. He served as one of the Luxembourg delegates to the United Nations General Assembly in 1957. Between 1959 and 1961, he was the chairman of the Luxembourg Board of Industrial Development, where he spent much of his time in New York City courting American businesses to invest in Luxembourg. By all accounts, Charles' venture was quite successful, both for Luxembourg - and himself. It was during Charles' time in New York that he met his future wife, Joan Dillon. Joan was the daughter of US Treasury Secretary Clarence Douglas Dillon and his wife, Phyllis. Like Charles, Joan had a privileged upbringing that included an education at Vassar College and a formal society debut in 1952. Joan lived for a time in Paris, where her father was the US Ambassador to France from 1953 to 1957. She married the next year to financial heir James B. Moseley with whom she had a daughter, also named Joan. The couple divorced just two years later. Charles' relationship with Joan was thought to begin around 1958 in New York. Marriage was not considered possible at first, as no commoner had ever married into the Grand Ducal Family. Joan's divorce made the matter even more complicated, as being a divorcée was still quite frowned upon during the time, both socially and in the eyes of the Catholic Church. As time went on, it was clear that the couple's relationship had deepened. Joan obtained an annulment of her first marriage in 1963, which allowed her to marry again within the Catholic Church. But the issue would not be forced until early 1967 when Joan became pregnant and marriage was seen as necessary. The engagement between Charles and Joan was announced on February 10, 1967. An "early spring" wedding was said to be anticipated. Less than three weeks later, on March 1, the couple married at the Roman Catholic Church of St. Edward the Confessor in Guilford, a town in Surrey, southeast England. The wedding was attended by Charles' parents and siblings as well as Joan's parents and conducted by Rev. Dr. Gordon Albion. Charles' brother Grand Duke Jean and Joan's father stood as witnesses. After the wedding, Charles and Joan returned to New York City where their daughter was born on September 15. The little girl was christened Charlotte Phyllis Marie, in honor of both of her grandmothers. The couple moved to Luxembourg shortly after, joining Charles' parents, his sister Elisabeth, and her two children living at Château de Fischbach Castle. Grand Duchess Charlotte had abdicated a few years' prior in favour of Grand Duke Jean. Charles' and Joan's son Robert was born there on August 14, 1968, and later described the atmosphere as being "akin to a mini Downton Abbey, but without all of the pomp and grandeur. Our lifestyle was very simple and down to earth, but with a permanent staff and infrastructure that are now part of a bygone era." Joan and Charles spent a quiet few years in the Grand Duchy, regularly appearing at official events. Charles also served as a member of the State Council of Luxembourg starting in 1969. When Prince Felix died the following year, Charles inherited his father's Tuscan vacation home, the Villa Reale d'Imbarcati in Pistoia, near Florence. The villa had been part of the immense estate of Felix's father, Robert of Parma. Five years later, Joan inherited the position of head Domaine Clarence Dillon, a French wine company that had been in the family for several decades. The Domaine also owned multiple Bordeaux estates and vineyards. The family spent much of the early 1970s renovating the various chateaux and replacing outdated equipment on the Domaine's properties. But the family's quiet life was unfortunately short-lived. Charles died on July 26, 1977, of a sudden heart attack at the Villa Reale d'Imbarcati in Pistoia less than two weeks shy of his fiftieth birthday. The Grand Ducal Family was to experience a second tragic passing in a short amount of time. Franz of Hohenburg, the estranged husband of his sister Elisabeth, died just twenty days later on August 16. Charles' funeral was held on July 30. Along with his wife and children, Charles' mother, siblings, and their children in attendance. Royal representatives (and more distant family members) from various countries were also present. He was buried in the grand ducal crypt at the Cathédrale Notre-Dame de Luxembourg. A year after Charles' death, Joan remarried to the Duke of Mouchy on August 3, 1978, in the US state of Maine. The couple continued their management of Domaine Clarence Dillon until their retirement early 2000s. Prince Robert has run Domaine Clarence Dillon since his mother's retirement in 2008, with both Joan and Charlotte serving as members of the board (Philippe, Duke of Mouchy died in 2011). Charles has six grandchildren by his two children. 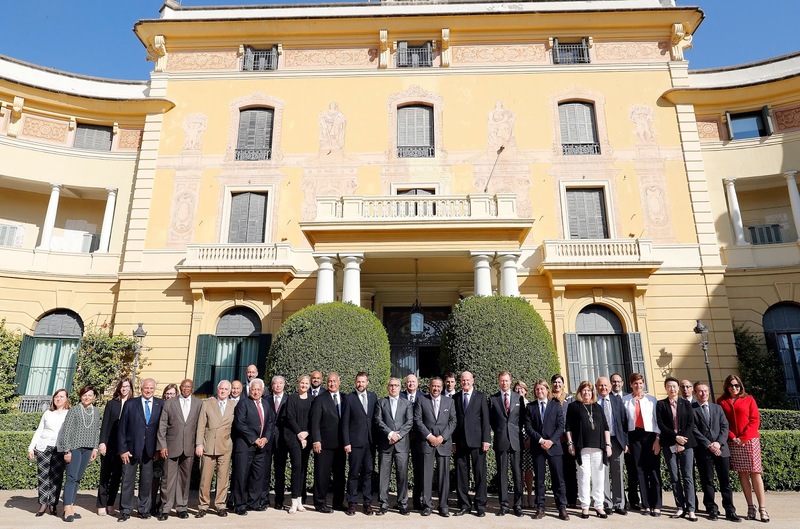 On the 11th, Grand Duke Henri was in Barcelona to attend a gathering of the Olympic Solidarity Commission, which focuses both on the larger idea of solidarity among Olympic athletes and also highlights the technical requirements for athletes and their coaches. Additionally, the organization supports National Olympic Committees (NOCs) and works to develop regional and national competitions for athletes. Grand Duke Henri has been a member of the International Olympic Committee (IOC) since 1998 and the Olympic Solidarity Commission since 1999. 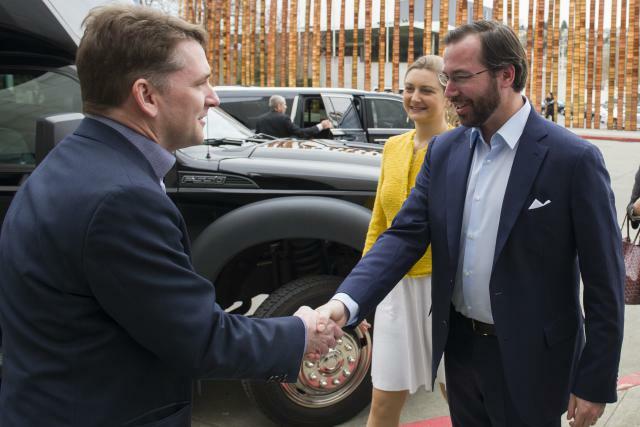 Hereditary Grand Duke Guillaume and Hereditary Grand Duchess Stéphanie made their way down the U.S. West Coast from Seattle to Califorina where they visited the Silicon Valley yesterday and today. On the agenda on Thursday was a visit to the NASA Ames Research Center. After a guided tour of the facility, the Hereditary Grand Duke and Hereditary Grand Duchess as well as their accompanying delegation met with representatives of different companies working in the field of advanced space technologies. They were also among the guests for the seminar "Developing New Markets in Space" hosted by Luxembourg Ministry of Economics. 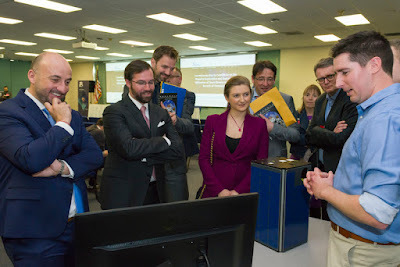 On the last day of their economic mission to the United States, Hereditary Grand Duke Guillaume and Hereditary Grand Duchess Stéphanie visited the SETI Institute in Mountain View, California. The SETI Institute is a private, nonprofit organisation dedicated to scientific research, education, and public outreach concerning matters of the origin and nature of life in the universe. Scientists from this private institute also supported by NASA presented various experimental projects related to space resources and space meteorology in an international context. The Luxembourgish government conveniently sent a photographer along on this economic mission and so they have a lovely gallery of visuals on their website. 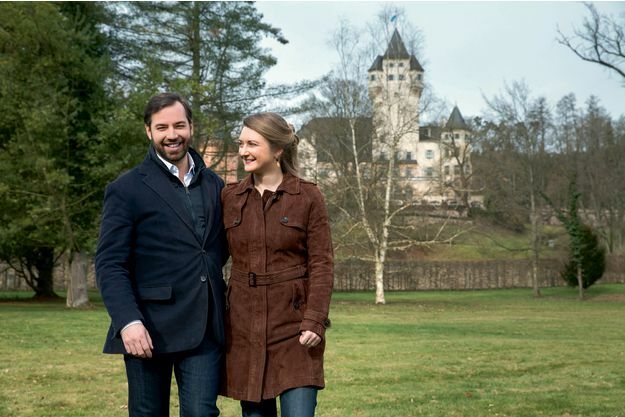 Interview with Guillaume and Stéphanie: "It Is A Strength To Work As A Couple"
This week's issue of Paris Match includes an interview with Hereditary Grand Duke Guillaume and Hereditary Grand Duchess Stéphanie. While yours truly hasn't gotten her hands on a copy yet, Paris Match conveniently offers parts of the interview online. In the parts of the interview provided online, the couple speaks about their work and interests. 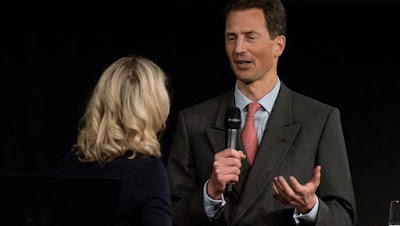 Asked about his preparation for his future role as Grand Duke, the heir to Luxembourg's throne answered, "I have been fortunate enough to have been [in this role] since my childhood. Thanks to the education I received from my parents and the ongoing dialogue I have with them on all issues concerning the country. I also trained at university, studying political science in particular. Now I can say that I am in a cycle of continuing education." While the Hereditary Grand Duchess says that while she hasn't been born into her future role, she doesn't see it as a disadvantage, "On the contrary, allowing different points of view makes us richer as a couple." About working together as a couple Stéphanie added, "We help each other a lot and regularly discuss matters together. I often accompany my husband on economic missions, a field that is more his responsibility. On the other hand, Guillaume supports me in commitments that concern me more specifically, the arts for example. It is a strength to work as a couple: two brains, twice as many ideas and time devoted to everything." Commenting on her involvement in Luxembourg's art world, Hereditary Grand Duchess Stéphanie says, "Art and history have always interested me a lot, I am convinced that it is important to know what happened in the past and what was done before us in order to understand the present and to build the future on a solid foundation." 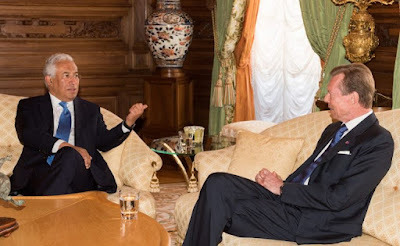 Hereditary Grand Duke Guillaume also shares in the interview that Holocaust survivor Paul Sobol and social entrepreneur Muhammad Yunus are two of the people he has met in his life that have impressed him the most. A little more has appeared from Day 1 of the economic mission that Hereditary Grand Duke Guillaume and Hereditary Grand Duchess Stéphanie are currently focusing on in the U.S. 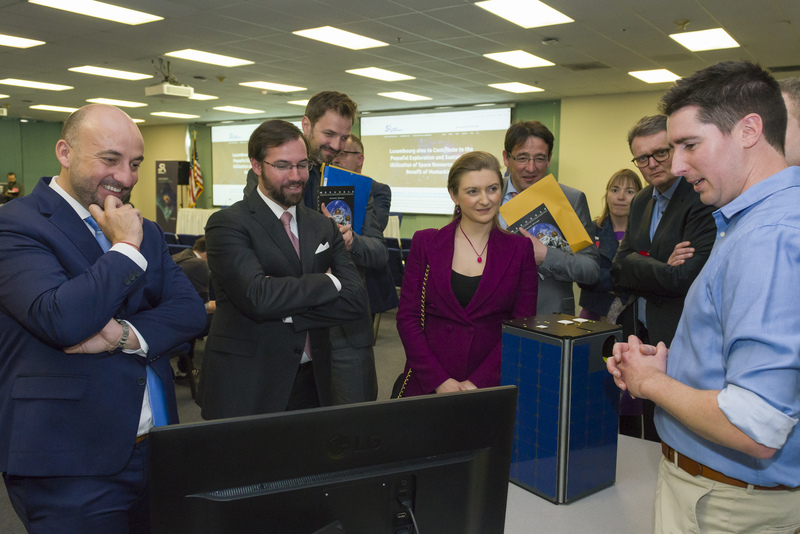 The first day of the tour, Monday the 10th, was in Seattle, where the Hereditary Grand Ducal couple visited Planetary Resources and Vulcan Aerospace. 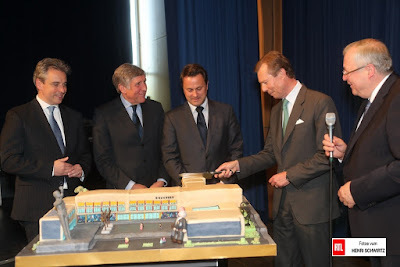 More photos from the Luxembourg Government site, RTL, and the local Fox affiliate. Also, some more information about Luxembourg's participation in the asteroid mining project. The Grand Duchess and I are shocked to hear about the news of the tragic events in Stockholm. Our thoughts and deepest sympathy are with the victims, their families and all those affected by this terrible attack. Here are the items I could identify for the Luxembourg Ladies from March 17 to April 7, 2017. Unfortunately, there is not much but as always, the post will be updated I find anything else during the week. 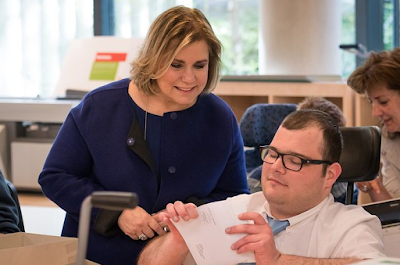 On March 29th, Maria Teresa was at the Banque Centrale du Luxembourg to attend a student workshop. 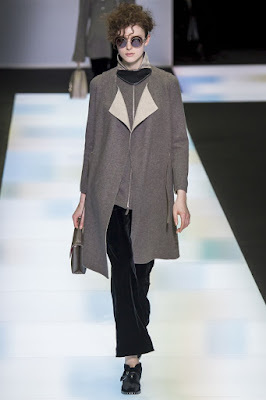 She wore her now favorite Giorgio Armani Fall 2016 jacket. On March 30th, Grand Duchess Maria Teresa visited KannerKlinik wearing her Armani Fall 2016 coat with houndstooth pumps and a green blouse that I have no infos on so far. 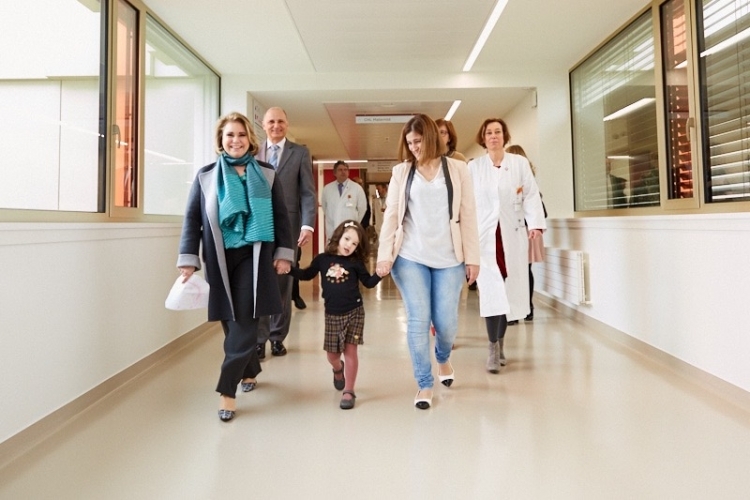 On the 30th, Maria Teresa also visited the Jean Heinisch Centre at Tricentenaire. 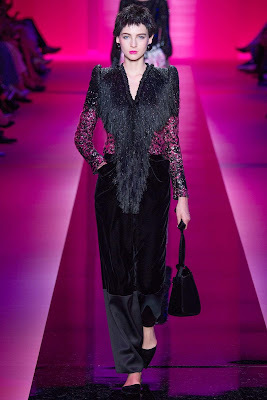 She wore a new purple coat. 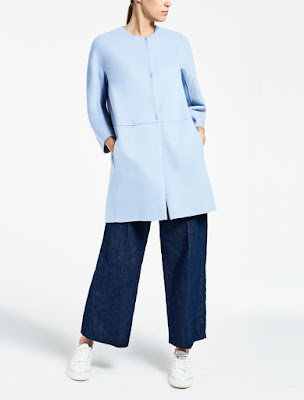 I think it could be a Max Mara , similar to the coat below but I have no exact stock photos. 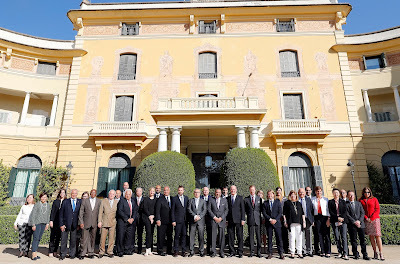 On April 4th, Grand Duke Henri, Grand Duchess Maria Teresa, Hereditary Grand Duke Guillaume and Hereditary Grand Duchess Stéphanie received members of the Diplomatic Corps at Berg Castle. Stéphanie wore a new Paule Ka dress and jacket. I don't have any info on Maria Teresa's outfit , it is probably Natan, but I can tell you that she was wearing Dior earrings. On April 5th, the Grand Duchess Maria Teresa spoke at the launch of the Microlux event. 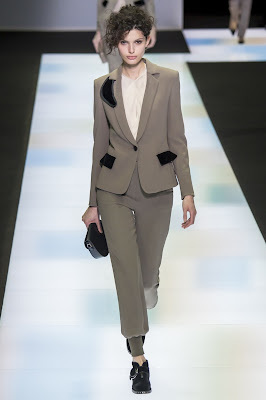 She wore a new grey pantsuit with a blue top. I think it's Armani but I haven't found it yet. 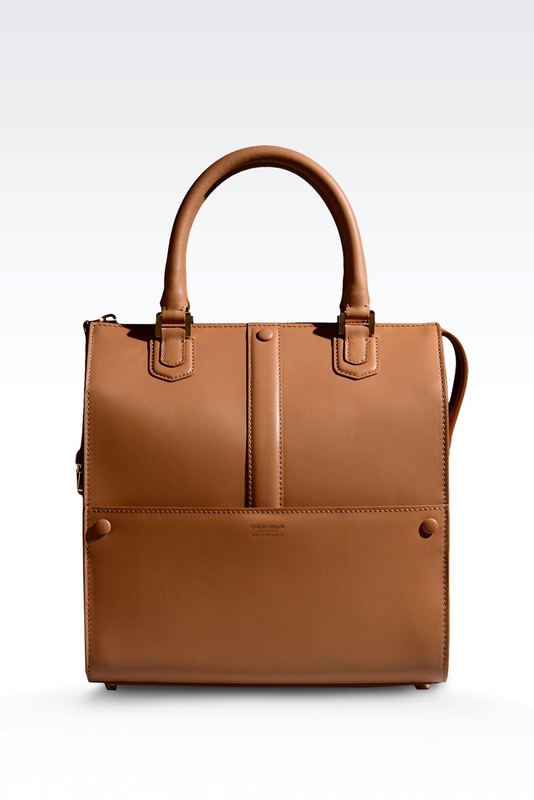 The bag is old and it is by Armani, similar to the model below. A little warning note, the next Fashion Friday post will probably be in three weeks and not two because I have exams for the next two weeks so I will obviously not have the time to look for Maria Teresa and Stéphanie's outfits. Guillaume and Stéphanie will be in the US next week so I should have more IDs for you. 'Tis is the season for state visits. Just last week, Argentina visited the Netherlands and our royal friends from Belgium visited their royal friends in Denmark exponentially multiplying the number of sparkle we got to see during a monarchy-monarchy state visit. And this week there was the visit from Spain to Japan. It made me ache for some Luxembourgish glitter. With no state visit on the horizon and National Day almost three months away, let's have a closer look at one of the grand ducal tiaras we haven't covered in more depths yet. Truth be told, the reason we haven't had an own Luxarazzi 101 about the Chaumet Diamond and Pearl Choker Tiara is that the name is basically all we can tell you about it. 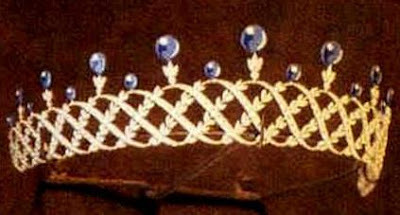 The fact that so little is known about the tiara frequently worn by the Grand Duchess and very occasionally other members of the Grand Ducal Family has left room for much speculation over the years. One of the most common stories about this sparkler is that it is a dramatic remodelling of a necklace once owned by Grand Duchess Charlotte. However, that theory seems rather unlikely as Chaumet has confirmed the following to us: The tiara is a "a unique piece made by Chaumet and [they] do have a nickel of the tiara in [their] salons but it is not the exact replica" adding that "it was sold during a public auction and now belongs to the royal family." As the tiara was purchased in public auction, it's rather impossible that materials used for it came from the Grand Ducal Family themselves. Chaumet also asked us to inquire further with the cour grand-ducale, but the cour being the cour a reply is still pending. It is generally believed that the tiara entered the family sometime during the life of Grand Duchess Joséphine-Charlotte. To the best of our recollections, her daughter Margaretha was the first member of the family to wear it during the early 1980's. 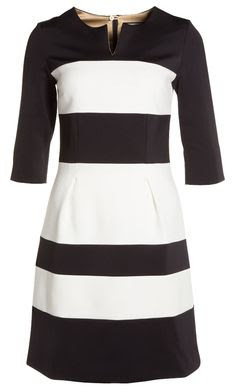 It has since become a regular for Grand Duchess Maria Teresa and was recently worn by Princess Alexandra as well. While its history remains a bit sketchy, one thing is for sure: The Chaumet Diamond Pearl Choker Tiara is one of the most versatile pieces in the Grand Ducal Collection: Not only can it be worn as a choker necklace, it is also believed that it can be set in no less than six tiara settings. It consists of an intricate latticework pattern of diamonds at the bottom with different settings of pearls and diamonds on top. 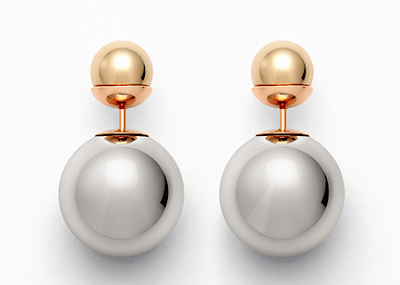 The pearls that we generally see mounted on top these days were originally sapphires according to the information provided with the nickel - which, keep in mind, isn't "the exact replica" - at the Chaumet museum in Paris. 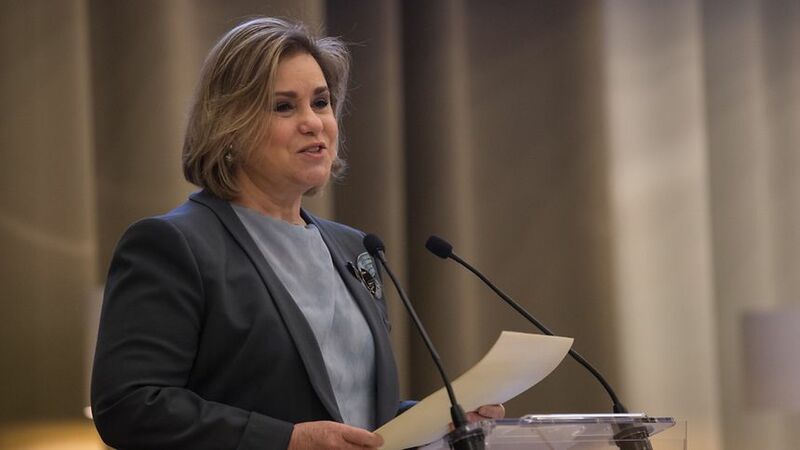 On the 5th, Grand Duchess Maria Teresa spoke at the launch event for Microlux, which offers the first microfinance program for people in Luxembourg. The institution focuses on providing finance opportunities for business start-ups and social entrepreneurs, through a network of volunteers. 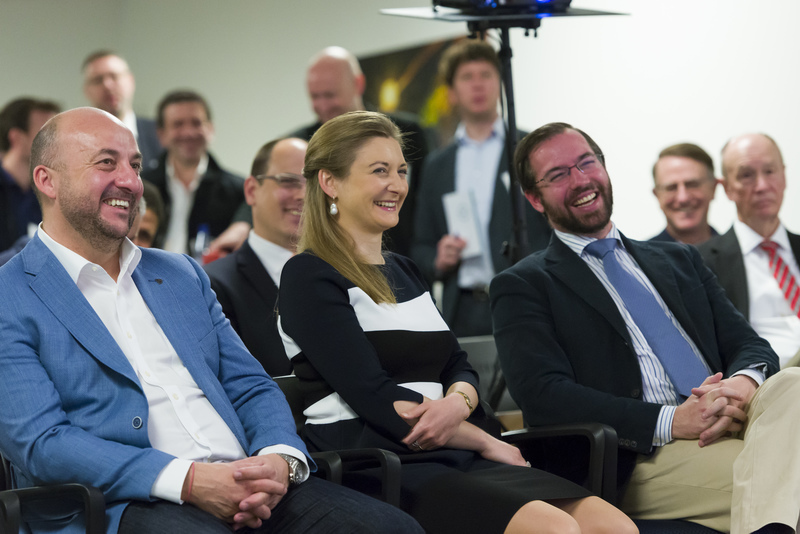 Microlux began operations in 2016, but this represents the official launch ceremony for the organization. In her speech, the Grand Duchess commented on the reality of poverty and financial limitations within Luxembourg, with Microlux opening up financing opportunities to those who might not qualify for standard business loans. In addition to the credit program, Microlux also offers a coaching program to assist with business development. François Bourgignon, formerly the Vice President of the World Bank, also spoke at the event, as did Maria Nowak, who founded Association pour le droit à l'initiative économique (ADIE) and served as President of the European Microfinance Network. ADIE, Appui au développement autonome (ADA), the European Investment Fund (EIF), and the Luxembourg-based bank BGL BNP Paribas are joint founders of Microlux. More photos at Wort, and now at the Cour [updated]. In what seems like one of the most cordial official visits - just look at the picture links - ever, the Prime Minister of Portugal António Costa paid a visit to Luxembourg today. Among other things on his agenda, he was received by Grand Duke Henri at the palais. It's probably no surprise that the Portuguese PM felt right at home in Luxembourg: And estimated 120,000 of the 550,000 people living in the Grand Duchy were either born in Portugal or are of Portuguese ancestry - and I guess the Grand Duke himself doesn't actually count into the statistic but he, of course, has two Portuguese great-grandmothers as well. Pictures (though no more of the Grand Duke) at Wort and Le Quotidien, a video including a short glimpse of Grand Duke Henri at RTL. C’est avec beaucoup de tristesse que la Grande-Duchesse et moi-même avons appris la nouvelle de l’attentat perpétré dans le métro de Saint-Pétersbourg hier après-midi. Il nous tient à cœur de vous exprimer notre profonde compassion et notre solidarité, particulièrement aux familles des victimes et au peuple russe tout entier. It was with great sadness that the Grand Duchess and I learned the news of the attack on the Saint Petersburg subway yesterday afternoon. It is important for us to express our deepest sympathy and our solidarity, especially to the families of the victims and to the entire Russian people.